Celebrium™ is the world’s first authentic digital celebrity collectibles platform. Our patent pending technology enables the individual authentication of a unique digital file. What that means is that the Celebrium Memos™ you receive are each unique, authenticatable and counterfeit proof. Each Celebrium Memo™ is built on digital authentication technology called the RAIDA. 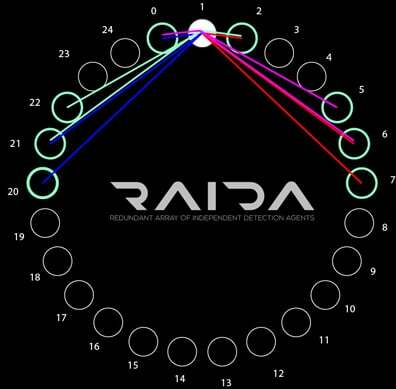 The RAIDA (Redundant Array of Independent Detection Agents) is an independent global network of authentication systems that use the Cloud Consortium algorithm to verify the authenticity of images or data created on the network. More simply, Celebrium Memos™ are created on the RAIDA and cannot be authentically duplicated. Making a copy of a Celebrium Memo™ would be like copying a dollar bill. It may look the same, but it’s not real. And you can prove that it’s not real in an instant. Only Memos from The Celebrium™ are real and their authenticity can be easily verified with the RAIDA. Our Celebrium Memos™ are official, from the celebrities themselves and are their own personal photos/art that they’ve authorized us to convert into a Celebrium™ Memo. The RAIDA network is fully scalable so our platform is not subject to transaction volume slows. The distributed cloud-based network of RAIDA nodes is currently capable of processing in excess of 24,000 transactions per second. Going forward, we plan to bring this technology to physical collectibles as well. Celebrium™ is a division of Digital Frontier Marketing.